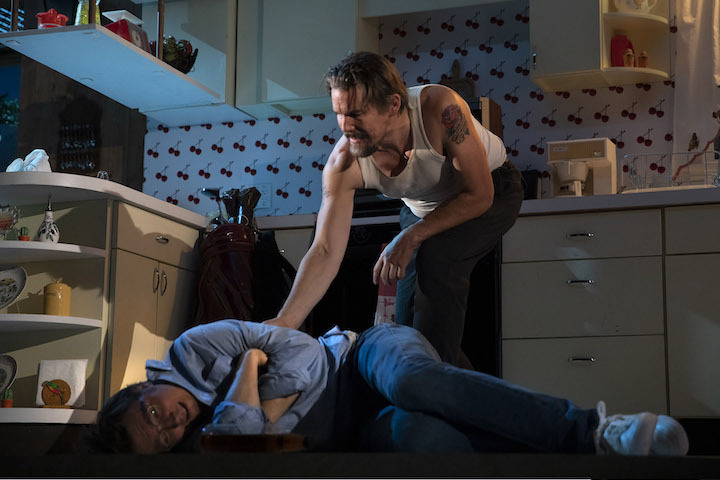 Few American plays of the past four decades have attracted as many revivals, in New York and elsewhere, starring top-of-the-line leading men, as has Sam Shepard’s 1980 True West. These have included the pairings of Gary Sinise and John Malkovich, Peter Boyle and Tommy Lee Jones, and John C. Reilly and Philip Seymour Hoffman. 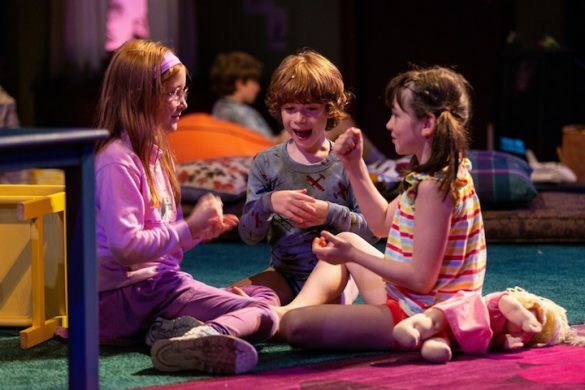 For the Roundabout’s curiously off-putting current version, directed by James Macdonald, Paul Dano and Ethan Hawke (Macbeth, Lincoln Center Theater) join the list but their performances don’t greatly enhance it. True West is true meat for those playing the Cain and Abel duo of Austin (Dano), a prim Hollywood screenwriter and family man, and Lee (Hawke), his grubby drifter, grifter, bachelor brother. Their mutual affection, distrust, and rivalry are expressed through verbal and physical thermodynamics within the pristine confines of their mother’s (Marielouise Burke) Southern California kitchen while she’s vacationing in Alaska. Fight director Thomas Schall gets to flex his staging muscles in violent scenes of sibling combat that send furniture, drawers, and props flying. A typewriter gets the hell beat out of it with a golf club, and one brother practically tears the other’s head off with a telephone cord. Except for the epilogue-like moment that concludes the play with a touch of poetic mysticism set against a desert sky, True West is a naturalistic dramedy about what happens when the edgy Lee, who’s been living off the grid in the Mojave Desert, decides to crash at his mother’s home. Austin’s there because he’s left his wife and kids “up north” so he can housesit mom’s plants and work on a project about “a simple love story,” which he’s been discussing for months with producer Saul Kimmer (Gary Wilmes). Their collaboration, in which the brothers begin to trade roles and their personalities start to mesh, leads to drunken brawls, a kitchen full of toasters stolen by Austin, and the ultimate destruction of their home, only for their mother to return earlier than expected. This is a technically proficient production. 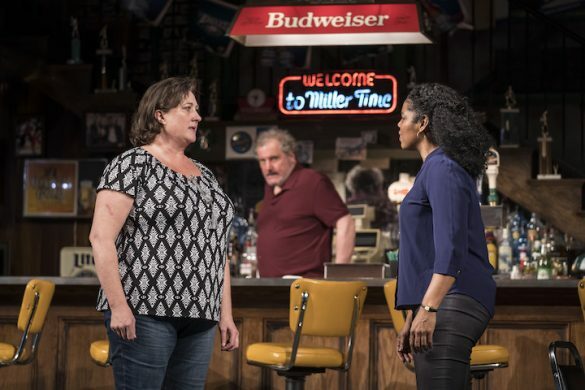 Its realistic set, designed by Mimi Lien, is placed within a frame bordered on all four sides by a ribbon of light that enhances Jane Cox’s impressively dark, scene-separating blackouts. Kaye Voyce’s costumes effectively suggest the early 80s but some seem at odds with the hot weather. Bray Poor’s original music and sound design, however, make perfect sense. 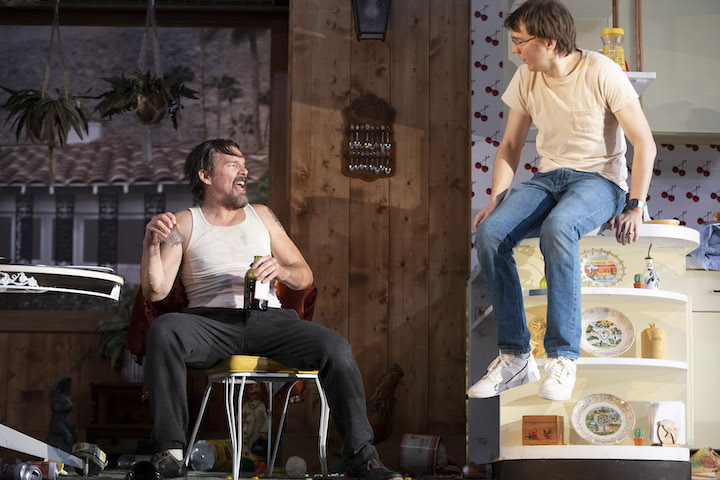 True West’s themes of the divided self, sibling rivalry, the spiritual hollowing of the American family, the commercialization of art, and the vanished West remain intact, of course. But, in practice, the argumentative stupidity and aggression in the brothers’ conflicts grow tiresome, even repetitious, over two hours and 15 minutes. Dano and Hawke work hard and provide lots of expressive variety but, while technically adept, their choices fail to create the authenticity the characters themselves are seeking. They also are too rarely genuinely funny or reflective of the “double natures” Shepard invested in these roles. The tone of dark but credible comedy blanketing Act I becomes increasingly incredible in Act II when black farce takes over. This wouldn’t be a problem if it were truly funny but the pockets of loud laughter at the American Airlines Theatre only make it more difficult to endure the excessive goings on. 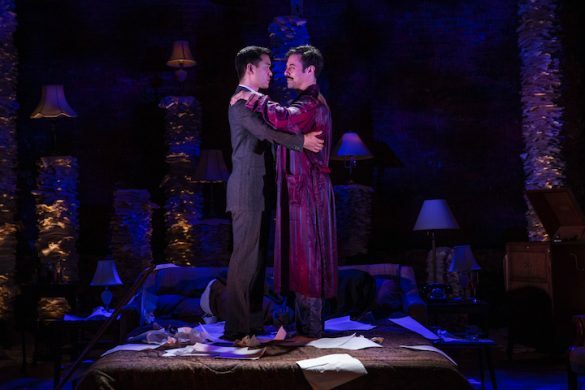 Austin and Lee are eccentric, and have laugh-provoking potential if perfectly played. Here, though, they become madmen and their mother’s home a madhouse. This is only exacerbated by the appearance of their mother herself, played by Burke with idiosyncratically comic but, oddly, little more than offhand frustration. She acts more like her boys were tots who’d written on the walls than someone who came home to find her kitchen in shambles and one son strangling the other. True West will surely return one day with another A-list pairing. After seeing its latest incarnation, however, I’m not certain even A+ names on its marquee can solve its problems.